Come and meet Tom and Dayo the giraffe at Wild Place Project. 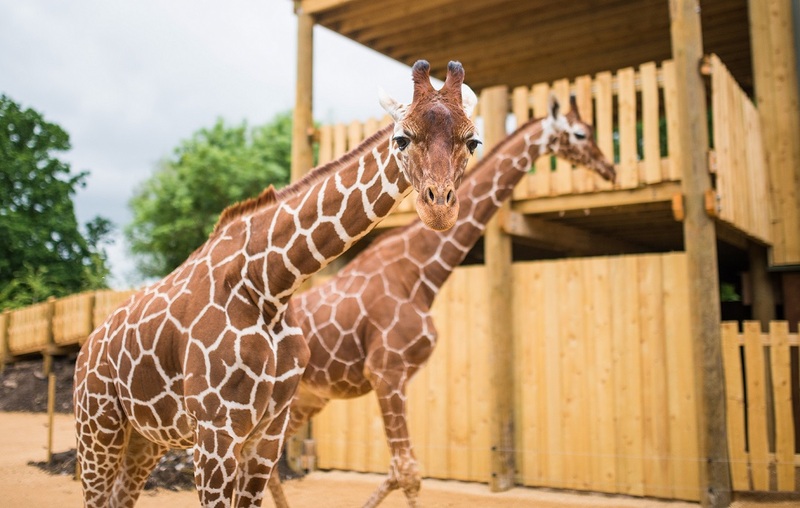 The world’s tallest animals are now settling in to their home at Wild Place Project in the newly completed enclosure built by construction specialists, Dribuild. Come and catch a glimpse of our two remarkable giraffes as they settle in and enjoy their newly built enclosure. The enclosure is open with plenty of exciting things to do and see and lots of great viewing opportunities of the giraffe when they are outside, which is often. Come on a journey with us to Benoue National Park and be immersed in what life is like in the wilds of Cameroon, Africa. Take a trip to HQ and find out how we are working to save giraffe from extinction with local conservationists and see what the eco-guards use to track giraffe and save giraffe from threats in the wild. Explore our Cameroonian inspired Market Village with a market stall and decoration for an authentic African adventure. There are lots of viewpoints into the enclosure, including watching the animals at the watering hole from 'the hide', where you can spy on our tall friends through a telescope. Test your eyesight and see if you can identify hidden giraffe spot patterns around the enclosure! Follow our exciting trail of tracks around the exhibit - do you know what a giraffe footprint looks like? The zebra and eland have moved to a new house just next door and will share the watering hole with our new residents. FACT: Did you know? Giraffe love a power nap! They only need between 20 minutes and two hours sleep per day. Poaching, bushmeat trade and habitat loss are threatening giraffe in the wild and without help, there would be a real chance they could become extinct. Our aim at Wild Place Project is to protect giraffe, safeguarding a population in human care alongside a sustainable population in the wild. We sent our conservation team to Benoue National Park in Cameroon to search for a sustainable population of giraffe. Drone technology has allowed the eco-guards at the park to search larger areas in order to establish giraffe population numbers and locations. This is vital work to support giraffe and in turn, provide long-term protection for giraffe in the wild. Thank you to our project partners for their ongoing support.